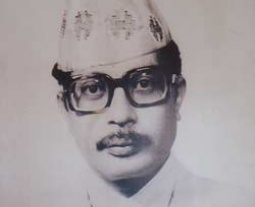 Narayan Gopal was born into a Newar family in Kathmandu. His father was a classical musician and wanted his son to follow his footsteps. Narayan Gopal was interested in music from an early age but not exactly into the classical field. At the age of 12 he met Prem dhoj pradhan (popular nepali singers) and they used to go in musical programs together. Narayan Gopal was very shy. He just used to tell other to sing, but he never sang. In B.S 2016 Prem Dhoj Pradhan took him to Radio Nepal to take a voice test, He sang "Panchi ko Pankha ma Dharti ko Ya diyo" written by Dr. Ram man Trishit and composed by Prem Dhoj Pradhan, which he passed on the first try. Gopal's first song recorded was the pop song "Swarga ki rani maya ki khani". His father was so upset thinking his son started singing useless songs and told Ratna Shamsher Thapa about it. Gopal then went to India to study classical music to make his father happier, but he was forced to return back. Gopal stayed there only for 4 and a half months and could not study music. Various problems forced him to return back to Nepal. While he went to India, "e kanchha thattaima yo baisa jana lagyo" spread and Gopal was already popular all over Nepal, including Darjeeling.